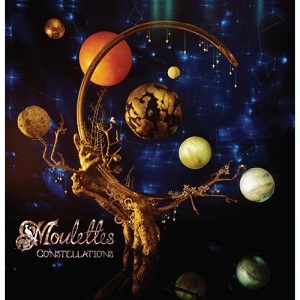 Constellations is the third album from Moulettes. It's not been recorded simply in a conventional recording studio - instead the band have chosen to record in a variety of places, from recording studios to churches, tunnels, bedrooms and workshops, so the different locations with their widely varying acoustics will impact on the recordings. They also brought in some special guests including the legendary Arthur Brown, herbie Flowers (Lou Reed/David Bowie), Emma Richardson (Band of skulls) and more. I've been listening to the album for a few weeks now and absolutely love it, but I've struggled to sit down and write the review, because of one simple question - how to describe the music? This isnt music that fits neatly into any reviewers genre pigeonhole. There's a mix of all sorts of styles with pop and folk being the most prominent, but there's also classical and so much more. The results of this mix are simply fantastic. The music is fantastic and the female vocals are lovely too. Check out the video below and you'll see what I mean - it's quirky, distinctive and utterly brilliant. A superb album that's well worth a listen. Kate Young - Violin, vocals.